The article headlined "Demolish Manor eyesore" (Mail, April 27) proves beyond any doubt whatsoever that Hartlepool Borough Council has little or no comprehension or knowledge of the history of the area it supposedly represent. Nor respect the heritage of Hartlepool and the subsequent manors. The council is operating on a one track policy of don’t maintain it, allow it to become run down, demolish it, sell it off for housing. Woodlands and Tunstall Court are two prime examples of how the council takes care of our heritage. Councillors Stephen Akers-Belcher and Alan Barclay should hang their heads in shame at the very suggestion of demolishing the ancient manor of Oughton. 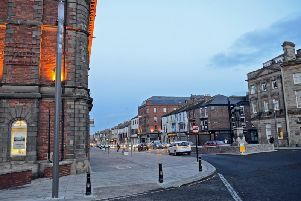 They should be putting all of their efforts into preserving the heritage of Hartlepool and restoring this ancient manor to its former glory. Allow me to inform the council about a small piece of our heritage which it wants to destroy, obliterate and remove from history. The following was written by William Page in his book, A Victorian History of the Counties of England. “Owton is first mentioned in 1146-51, when Robert de Brus held in demesne at Seaton 90 acres which were anciently in the field of Oughton and in Oughton itself 220 acres. “In 1189 Peter Carew held one knights fee in Seaton and Oughton. Between 1218 and 1234 Avice de Clare obtained licence from Michael the Prior and the convent of Guisborough to have a chantry in the chapel of Oughton as long as she lived. Thomas de Carew claimed two thirds of two carucates except one oxgang against Avice de Clare in 1269; however, it does not appear with what success. “In 1358 a deed was enrolled by which Robert son of John de Sheraton granted to Richard Aske an annuity of £10 from his lands in Oughton. “In 1431-2 Thomas Lambert held the manor of Owton, and had held it for some years. “Although there are several links missing in the pedigree, it seems probable that he was the ancestor of ‘Robert Lambert of Oughton’, who in 1524 received a general pardon and gave sureties for his good behaviour. “In 1543 Nicholas Lambert, the son of Robert, settled Owton in tail upon his sons Robert, George and Clement successively. “Robert the eldest son was attained for taking part in the Rising of the North, and narrowly escaped execution; his lands here, including a windmill and a manor-house of stone, roofed with slate, were forfeit to the Crown.